The record label duly notes that the ensemble's lineup is a pedigree from estimable progressive rock-based bands such as White Willow, Henry Fool, Änglagard, The Tim Bowess band, and more. 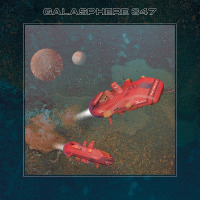 Formed in 2018, Galasphere 347 occasionally draws similarities to prog giants, Porcupine Tree and Riverside amid the electro-symphonic stylings of many outfits from the strikingly advanced 1970s era and beyond, where rock was no longer relegated to 2/4 and 4/4 cadences with more emphasis placed on musicianship and complex song-forms. Legendary Pink Floyd engineer Andy Jackson wields his magic on this outing, awash with a detailed mix, and electronics effects layered in the background to expand the ensemble's sound. With dreamy riffs and Stephen Bennett's wistful, low-key and hush-toned vocals, the band fabricates majestic mosaics, partly due to a storming impetus, dynamic rhythms and a polytonal force-field, as they elicit fond memories of prog rock's not so humble beginnings, namely the British Canterbury scene with keyboardist Ketil Vestrum Einarsen's mystical flute passages and beefy Moog solos. The album consists of three extended tracks and clocks in a little over 41-minutes. Needless to state, the musicians take care of business sans any bloat or over-indulgent soloing escapades. They focus more on the compositional aspects here. On "The Fallen Angel" the musicians gel to an up-tempo rocker, anchored with Jacob Holm-Lupo's undulating bass lines and Einarsen's silky analog Moog phrasings atop a snappy pulse, sweetened by the vocalist's harmonious choruses. However, the musicians integrate warm colors into the mix with swirling crescendos and a few passages augmented by Einarsen's fuzz-toned single note electric keyboard leads, reminiscent of legendary Soft Machine keyboardist Mike Ratledge and National Health's Dave Stewart. Hence, it's a more than welcome surprise. The band institutes Ravel "Bolero" movements and calming midsections but ignites the turbocharger with heavy keys and stinging guitars, as drummer Mattias Olsson's big presence reinforces the musicians' hot and heavy discourses. Overall, it's a quality debut. And it's wholly apparent that the musicians are seasoned vets in this idiom, by exercising restraint when the situation calls for it or letting their hair down when it's time to up the ante. Coupled with the melodious hooks and well-coordinated detours, this is a unit that is seemingly on track to create a name for itself, if they choose to do so, via subsequent releases. Track Listing: The Voice of Beauty Drowned; The Fallen Angel; Barbarella’s Lover. Personnel: Stephen Bennett: vocals, keyboards, guitar, Ketil Einarsen: keyboards, programming, flute; Jacob Holm-Lupo [aka The Pale Fire]: guitar, bass guitar; Mattias Olsson: drums, keyboards, guitar.